There were two locally famous John Boyd Thachers -- and both served at Mayor or Albany. The second was mayor from 1926 to 1940 and took a stab at the Governor's office in 1932. But Thacher Park was named for his uncle. The first John Boyd Thacher was born in 1847 in Ballston Spa. He graduated from Williams College in 1869, moved to Albany, and went to work at his father's Thacher Car Wheel Works on Thacher and Learned Streets. The business built railroad undercarriages; John worked in the foundry's moulding department. Eventually, though, he followed his father -- who was friends with Erastus Corning (the first Erastus Corning) -- into politics. 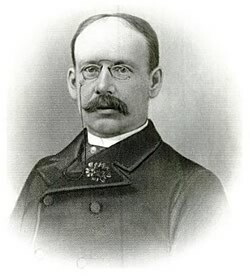 Thacher was twice elected mayor of Albany (1886 and 1896), served as the state senator from Albany County in 1883 and eventually ran for governor in 1896. But he was a Democrat who supported continuation of the gold standard, a difficult position that year because Democratic presidential candidate William Jennings Bryan was championing bimetallism and free silver. Thacher was obliged to withdraw from the race. President Harrison appointed Thacher a member of the Columbian Exposition. He championed the topographic mapping of the New York State, bought a collection of signatures from the original signers of the Declaration of Independence, and was also a noted writer, producing a hugely detailed exploration of the life of Christopher Columbus and an account of the trial of William Shakespeare. Thacher was also a collector. He amassed a major collection of incunabula that now resides in the Library of Congress. Before his death in 1909, Thacher collected a substantial amount of real estate around his summer residence in the Helderbergs, including the spring end of Thompson's Lake, three-and-a-half miles of the Helderberg ridge, Indian Ladder, Hale's Cavern, Tory's Cave, and Helm's Crack. His widow, Emma Treadwell Thacher (for whom the park's nature center is named), granted this estate, already well recognized for its importance, to the State of New York in 1914. 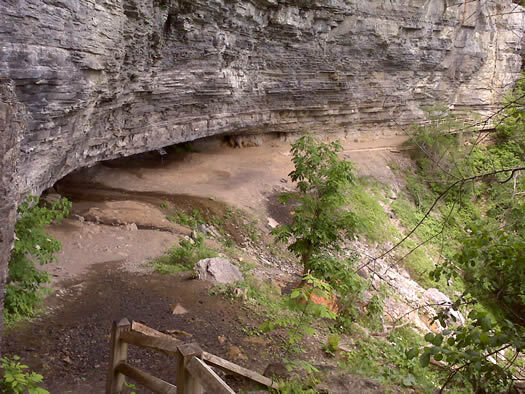 It was immediately named John Boyd Thacher State Park. Thacher is buried beneath one of the most beautiful tombs in Albany Rural Cemetery. First post by Carl, nice! I'm going to totally out him because he is also a pretty good photographer (here and here) and admin for the Troy, Schenectady and Upstate New York Flickr groups (phewww). Lots of photos right there. If it's the Carl I know, that is. if we're doing detective work here, we can probably cross the Carl Johnson who lives in San Andreas off the list. Thanks for the info - lovely place, that Thacher park. I'm glad it was preserved and not developed. Great post. I was at the park a few weeks ago and there's a marker on the overlook providing an abridged background on the Thachers. Most striking to me was their explicit insistence that Thacher be forever dedicated as a natural public reservation -- a gift to the people of New York.